The Best Western Aramis Saint Germain offers a welcome retreat for visitors to Paris. 42 well-appointed soundproof guest rooms offer a tranquil space to relax, with modern modern comforts. Enjoy a drink at the wine bar, which features a warm, contemporary ambiance. With an ideal setting on Paris' Left Bank, you'll find popular attractions such as the Luxembourg Gardens, the Notre Dame Cathedral and the Eiffel Tower are within easy reach. 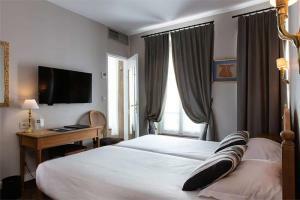 Located approximately 19 miles from Charles de Gaulle Airport and about This hotel is about 9 miles from Orly Airport. Montparnasse Station is approximately half a mile away.